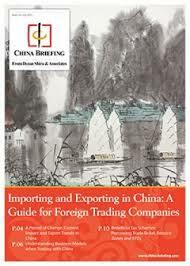 In this issue of China Briefing, Dezan Shira & Associates discusses the latest import and export trends in China, and analyzes the ways in which a foreign company in China can properly prepare for the import/export process. With import taxes and duties adding a significant cost burden, Dezan Shira & Associates explain how this system works in China, and highlight some of the tax incentives that the Chinese government has put in place to help stimulate trade. Dezan Shira & Associates is China’s largest independent business advisory and tax services consultancy, specializing in advising international businesses on their corporate structuring and on-going compliance for their China investments.